Celebrating the 200th anniversary of the Battle of Waterloo, a horse-drawn post chaise will process from Greenwich to a Royal Ceremony at St James's Square, attended by HRH The Princess Royal, followed by a parade of military bands down The Mall. The New Waterloo Dispatch commemorates a defining moment in European history - when news of the British and Allied Forces victory over Napoleon reached London - with a parade and military bands marching from Horse Guards Parade down The Mall. At the end of the journey, replica Eagles will be laid before HRH The Princess Royal at St James's Square and the Waterloo Room in the East India Club where the Prince Regent received the message of victory 200 years ago. 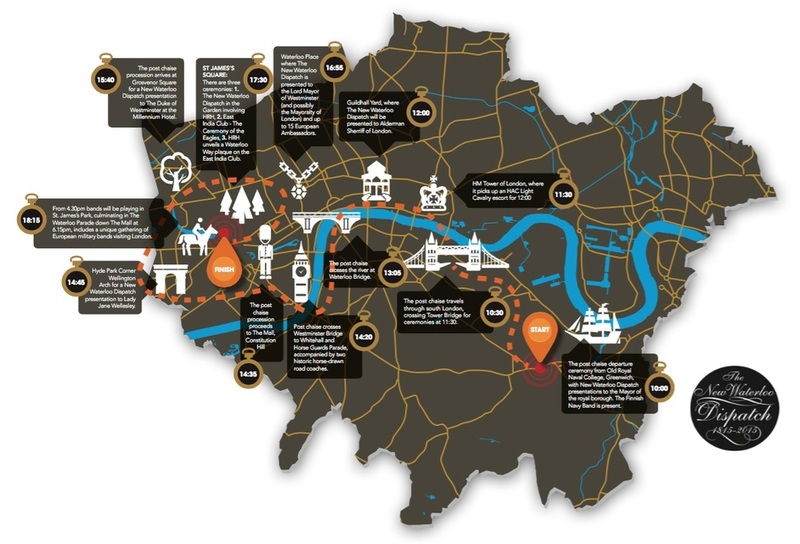 What are the best dining options near The New Waterloo Dispatch: Battle Of Waterloo Bicentenary Parade London? The New Waterloo Dispatch: Battle Of Waterloo Bicentenary Parade gyms, sporting activities, health & beauty and fitness. The best pubs near London The New Waterloo Dispatch: Battle Of Waterloo Bicentenary Parade. The New Waterloo Dispatch: Battle Of Waterloo Bicentenary Parade clubs, bars, cabaret nights, casinos and interesting nightlife. Where to have your meeting, conference, exhibition, private dining or training course near The New Waterloo Dispatch: Battle Of Waterloo Bicentenary Parade. From cheap budget hotels to luxury 5 star suites see our discounts for Horse Guards Parade hotels, including Club Quarters Trafalgar Square from 77% off.